This year’s Eco-Logic Awards, hosted by The Enviropaedia, was a celebration of the visionaries and innovators who are finding solutions to our most pressing environmental challenges. The Awards took place at the CSIR in Tshwane last night and honoured individuals and organisations who are contributing to a sustainable future. Pictured above is Charne Blignaut, winner of the Eco-Youth Award in her upcycled outfit made from instant cappucino packets and soda can tabs at the glamorous event, which was a highlight of Sustainability Week. Guests came dressed in their gorgeously green attire. The best dressed was Dr Michelle Henley Head Researcher at Elephants Alive! and Craig Spencer, Founder of Black Mamba’s Anti-Poaching Unit who won luxury safari holidays at White Elephant Lodge in KwaZulu-Natal. Each award winner was honoured on stage for their remarkable efforts as eco-logical individuals and organisations. The Biodiversity Award (sponsored by Sun International): Local Action for Biodiversity: Wetlands South Africa. The Climate Change Award (sponsored by the Department of Environmental Affairs): Simply Sustainable. The Eco-Innovation Award (supported by the City of Tshwane): Solar Veranda. The Energy Efficiency Award (sponsored by Eskom): Hot Spot by AET Africa. The Recycling and Waste Management Award:Reliance Compost. The Transport Award (sponsored by SANRAL): Bicycles and Beyond. The Water Conservation Award (sponsored by Coca-Cola Beverages SA): Water Explorer by WESSA. The Green Economy Award (sponsored by NCPC-SA): GreenCape Sector Development Agency by GreenCape. The Municipalities Award (sponsored by Santam): Atteridgeville Recycling Park by City of Tshwane. The Eco-Community Award (sponsored by CHEP): Umgibe Farming Organics and Training Institute. The Eco-Angel Award (sponsored by Pam Golding Properties): Nonhlanhla Joye of Umgibe Farming Organics and Training Institute. The Eco-Warrior Award (sponsored by SodaStream): Lorraine Jenks of Hotelstuff / Greenstuff. “I feel so honoured that my hard work has been acknowledged and celebrated; I hope to inspire other young people to take action in protecting our eco-systems. 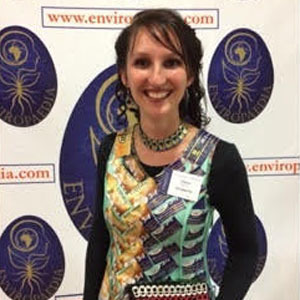 Together, we can make a difference and positively influence our future,” says Charne Blignaut of CB Scientific and winner of the Eco-Youth Award. “The calibre of winners is truly impressive, from the interactive water saving mission of Water Explorer who won the gold award in the Water Conservation category, to the incredible innovation of Solar Veranda, winner of the Eco-Innovation Award; they have all inspired us,” concludes Parry-Davies. Enviropaedia would like to thank all the sponsors who sponsored the Eco-Logic Awards 2017, these include CHEP; the City of Tshwane; Coca-Cola South Africa; David Green Eyewear; the Department of Environmental Affairs; Mico IT Recycling; National Cleaner Production Centre (NCPC); Eskom; Pam Golding Properties; SANRAL; Santam; Sodastream and Sun International without whom the event would not have been possible. Keep up to date with the annual Eco-Logic Awards by visiting the website http://www.enviropaedia.com and find out more on Facebook (https://www.facebook.com/Enviropaedia) and Twitter (https://twitter.com/EcoLogicAwards).